Using apps on a phone can lead to greater distractions. A self-inflicted interruption can happen as much as every 15 seconds. One study found that people switch between computer programs as much as 566 times in an average workday. In addition, after being distracted in a self-inflicted manner, it can take as much as 25 minutes to return to a task. In the meantime, an average of 2-3 other tasks have appeared to fill in the meantime. This is largely because the brain has a built-in novelty bias and is constantly on the lookout for new and usual things. This may be a result of the need to spot dangers before they become a problem. Because distractions can be so effective, it’s important to deal with them ahead of time before being forced to expend willpower to defeat them as they happen. 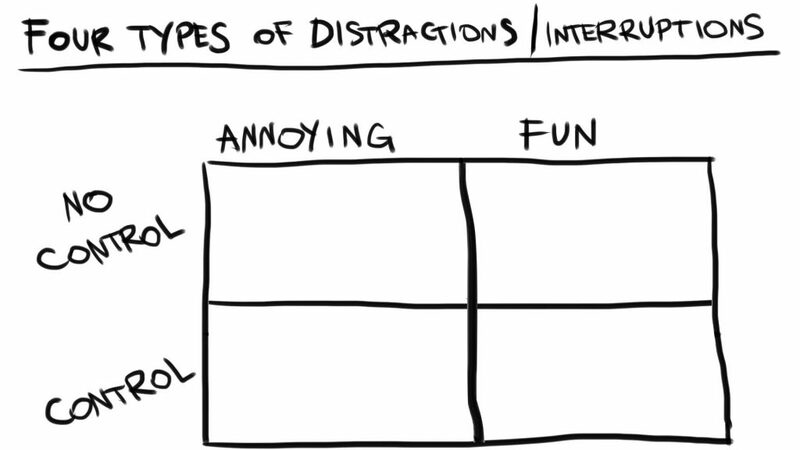 Create this distraction matrix and fill it up with every single distraction that can be thought of an categorized into the matrix. It doesn’t matter if the distractions are relevant to any given moment. Simply put them down in order to be aware of what they are (or, perhaps, keep multiple matrices). Be aware that distractions from others are not as damaging as distractions to oneself. The best way to deal with either is to keep remembering to re-focus on the original intention and get back to work. 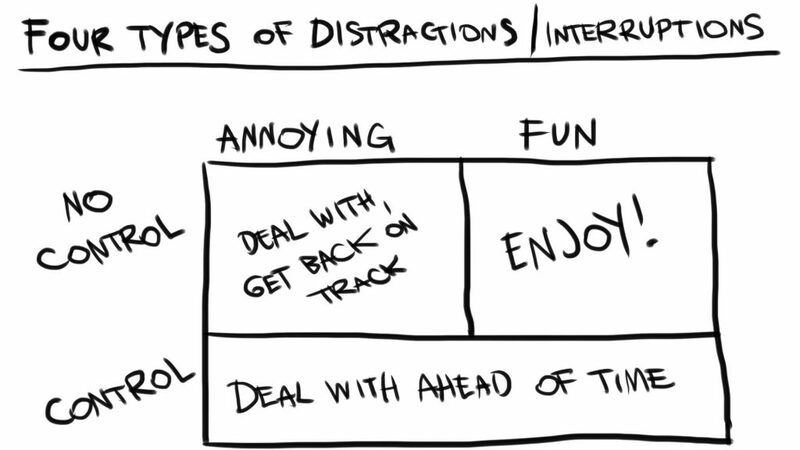 The best way to deal with fun distractions is to actually enjoy them. Use them to relax and enjoy life a bit, while periodically making a note about getting back on track when the distraction is over. Periodically go through the phone and delete unnecessary apps or excessively distracting apps. Don’t buy a new device without asking what purpose it really serves. Be sure how necessary it is before acquiring it. For managers, if possible, challenge the attendee list. Does everyone need to be there? Hyperfocus on the meetings to get the most out of them. If you’re there, you may as well get something out of it. Disconnect from the Internet to the greatest degree possible. For all its benefits, it can still be an enormous time trap. About half the time spent on the Internet is pure procrastination, reducing the amount of value per moment that it takes up. People with smartphones tend to check them every 3 to 5 minutes. What is more, the mere presence of a smartphone in the periphery of one’s vision has been found to interfere with social and relationship quality. Keep phones and tablets in another room to avoid distractions, if possible. Cleanliness can also be a factor. Clean environment tend to be more conducive to focus and messy environments tend be more conducive to creativity. Research suggests that productive music has two attributes. First, it sounds familiar. Second, it is relatively simple. Further, ideally, there are no words to listen to. Essentially, the music doesn’t have much going on when listened closely, but can be comforting and easy when it sits in the background. The value of background music is to drown out outside noise. Conversations and chatter can distract, especially if one is prone to imagining the other half of a phone conversation. Using music to mute the noise out is helpful. The brain is an idea machine. This also means that thoughts are not meant to be stored in the mind for too long. Keep a notebook handy at all times in order to jot ideas and information down. This used to be called a Commonplace Book and it was once quite a popular thing to have. Storing the information there allows the brain to free up its resources for Hyperfocus.